The acclaimed author of The Other Wes Moore continues his inspirational quest for a meaningful life and shares the powerful lessons—about self-discovery, service, and risk-taking—that led him to a new definition of success for our times. The Work is the story of how one young man traced a path through the world to find his life’s purpose. 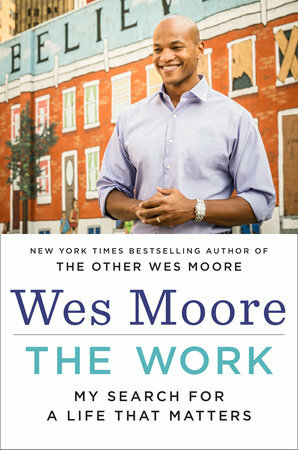 Wes Moore graduated from a difficult childhood in the Bronx and Baltimore to an adult life that would find him at some of the most critical moments in our recent history: as a combat officer in Afghanistan; a White House fellow in a time of wars abroad and disasters at home; and a Wall Street banker during the financial crisis. In this insightful book, Moore shares the lessons he learned from people he met along the way—from the brave Afghan translator who taught him to find his fight, to the resilient young students in Katrina-ravaged Mississippi who showed him the true meaning of grit, to his late grandfather, who taught him to find grace in service. Moore also tells the stories of other twenty-first-century change-makers who’ve inspired him in his search, from Daniel Lubetzky, the founder of KIND, to Esther Benjamin, a Sri Lankan immigrant who rose to help lead the Peace Corps. What their lives—and his own misadventures and moments of illumination—reveal is that our truest work happens when we serve others, at the intersection between our gifts and our broken world. That’s where we find the work that lasts. An intimate narrative about finding meaning in a volatile age, The Workwill inspire readers to see how we can each find our own path to purpose and help create a better world.